Onkyo has updated its most popular AV receiver, but was it worth it? The world's hottest AV receiver has had a facelift. After breathing new life into the moribund AVR market with the TX-SR605 last year, Onkyo has returned with a sequel product, the £400 TX-SR606. A cursory glance would indicate that there's little real difference between the two models, so what's new? Well, certainly not the look of the receiver, which I must confess to not being that enamoured with. The angular fascia and the impossibly small buttons with unreadable labels make me want to hide it away in a cupboard. Our review model was black, but a silver option is also available. What is all new for 2008 is 1080i upscaling, two more HDMI sockets, and Dynamic EQ tech. This year's remote control is completely different, too. It's not a learning remote and there's no fancy LCD display on it, but it is well designed and can control other Onkyo components. And, now that the company has introduced equipment control using the HDMI CEC protocol (dubbed here RIHD), it should be able to control a range of other kit. Panny's VieraLink, Toshiba's RegzaLink, Samsung's Anynet+ and select Sharp's TVs are all compatible when laced up via HDMI. Connectability is very good for the price point; the four HDMI inputs give you the same flexibility that you would enjoy on a higher-end receiver. They can all pass through a 1080p signal and handle uncompressed multichannel audio, including DSD from a Super Audio CD player. There's no Ethernet port or USB inputs, though, so you can forget about any networking or multimedia playback functionality. That's reserved for Onkyo's higher-priced flagships. Ease of use is better on the 606 over the 605. Onkyo has significantly improved its GUI. It's perhaps not quite as flashy as Sony's receiver interface, or as intuitive as Denon's, but the new icons and larger text size make the initial setup procedure a lot more user-friendly. You can, of course, skip complex manual calibration altogether if you use the Audyssey auto setup feature. Just plug in the supplied microphone, position it in your favourite chair and start the audio test. The Onkyo will set its own speaker level and delay times. All you have to choose is how you want to allocate the seven speakers. If you have a 5.1 system, the spare rear surround channels could even be used to drive a stereo pair in another zone, although I would always recommend matching the box with a 6.1 or 7.1 speaker package. The TX-SR606 seemed happy driving my 6.1-channel cinema, sending plenty of oomph to each Miller & Kreisel speaker. It's rated at an optimistic 140W per channel into 6 Ohms , but in our Tech Labs, we measured the receiver's real world output at 122W in two-channel mode, dropping to just 38W with five channels driven (at 8 Ohms). That may sound low, but it's actually a slight improvement on the SR605, and don't forget that this is a £400 amp. That said, it has enough transient power to deliver the bombastic sound effects of Blood Diamond on Blu-ray with the same comparative detail of its predecessor. It's a brash, exciting amplifier that's tuned for fine detail and bass thump. It therefore makes short shrift of modern movie soundtracks, as long as you don't try and crank it up much, as which point it becomes a bit breathless. Just flick to a chapter on Blood Diamond to hear how well this AVR handles short, sharp bursts of gunfire. A less dynamic amplifier would have trouble convincing your speakers to make such sound effects convincing, but here there's enough rampant power to really feel the impact. The metallic click of the reload will probably make you jump, too. The ocean-deep bass and crunchy treble manage to convey a broad musical soundstage too, but I feel the lack of mid-range expression and muscle extension prevents this receiver from sounding like a true hi-fi amplifier. Vocals and acoustic instruments just don't have the depth of the models higher-up the range. The SR606 is better suited to rock and dance music, and action movies, than classical music and costume dramas. But then you do a reality check and remember this is basically an entry-level product; somehow it just feels like it should be compared to stock much richer. And that I guess is the ultimate compliment. Using HDMI as the primary input, there's little this model can't accomplish. I was very impressed by its performance when it took an uncompressed DSD stream from a Super Audio CD via HDMI from my 80GB PlayStation 3. It's also still one of the relatively few affordable receivers able to decode DTS-HD Master Audio and Dolby TrueHD soundtracks from a Blu-ray disc. The 606 will signpost the jump in clarity and bass extension when you switch from regular 5.1 mixes to their higher-res cousins. Try Chapter 3 on Close Encounters of the Third Kind: Ultimate Edition and select the DTS-HD MA track to hear for yourself. As well as extending the bass notes lower as the alien ship hums overhead, making everything resonate, the sound effects seem supremely well-placed to put you in the centre of the action. The main new tech running throughout Onkyo's 2008 AVR range is Audyssey Dynamic EQ. This clever audio processing maintains the dynamic range of a soundtrack, even when the volume is lowered. Normally, when the level drops, LFE and ambiance vanishes. Dynamic EQ does a great job of maintaining the balance. The onboard scaler is also intriguing. While it doesn't upscale to 1080p, it does make a decent fist of building up SD images to 1080 lines and a better one of making 720p images. If you don't have better upscaling at source, perhaps in a Freeview box or standard Sky receiver, it's a worthwhile addition to the feature roster. Of course, it's rare for a DVD player not to have its own scaler these days too, and again, the only way to find out which component is the best at upscaling is to compare them. I discovered that my Denon DVD-1910 did a better job of turning 576 lines into 1080 than the Onkyo, but the Onkyo was certainly better at it than an older Samsung player, which caused blocking and softness. Of course, if you have a 1080p source, you can simply pass this straight through without any scaling, thanks to the latest HDMI 1.3a ports. And with four of these to choose from you're fairly well future-proofed. By adding a scaler, Dynamic EQ, two extra HDMI ports, and improving the power output (albeit slightly) Onkyo has crammed enough inside the SR606 to bring it bang up-to-date. 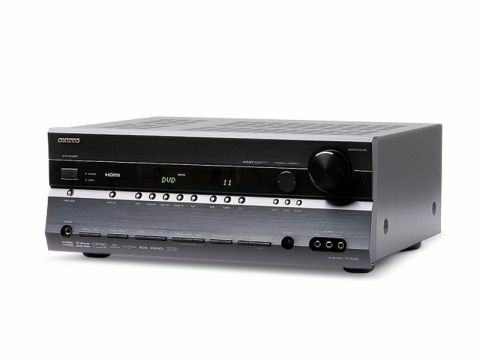 The danger was always that this could push the features-to-performance ratio out of whack and compromise the Onkyo's audio prowess. Fortunately hasn't happened. The chassis, outward design and most of the internal electronics seem exactly the same. As I've said, the sonic balance is geared toward action movies and in-your-face soundtracks, which it handles very well, lending real impact to explosions and picking out treble detail in complicated mixes. It's not the most refined sound, but its dynamic and direct approach will certainly have wide appeal. And there's no doubting this box of tricks is extraordinary value. In short, this is one sequel that I suspect will do even better business than the original.